This cloud chamber is designed to keep the environment friendly for observing ionizing radiation. The group over at the LVL1 Hackerspace put it together and posted everything you need to know to try it out for yourself. 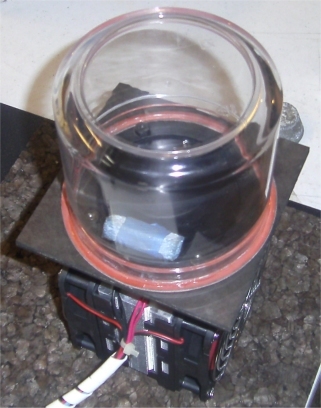 A cloud chamber uses a layer of alcohol vapor as a visual indicator of ionizing particles. As the name suggests, this vapor looks much like a cloud and the particles rip though it like tiny bullets. You can’t see the particles, but the turbulence they cause in the vapor is quite visible. Check out the .GIF example linked at the very bottom of their writeup. The chamber itself uses a Peltier cooler and a CPU heat sink. The mounting and insulation system is brilliant and we think it’s the most reliable way we’ve seen of putting one of these together. Just remember that you need a radioactive source inside the chamber or you’ll be waiting a long time to see any particles. They’re using a test source here, but we saw a cloud chamber at our own local Hackerspace that used thoriated tungsten welding rods which are slightly radioactive. Great project and very clean. Would be great for a class or science fair project. Not to be a spelling Nazi but “presence” is misspelled in the first paragraph. Truly Mad Scientist’s Splinter Group needs a proofing editor. Thank you. Another addition I’d add would be a thermocouple to get a reading of the internal temperature. I made a cloud chamber and tried aluminum for the baseplate. It conducts heat too well and my TECs couldn’t keep it cool. If I ever get around to testing all my TECs and re-assembling the unit I’ll submit it here. As for the base plate (acrylic), I used a copper plate originally, but it was large and allowed ambient heat to be conducted inward. I chose acrylic but could have reduced size of copper but copper cutting not in list of skills. The peltiers have an insullating shroud/disk. All contact with the peltiers is thermal compound and surface with compression force added by the retention bracket. On a side note, a local science center may build another at the hackerspace for student demos. The plan is to have temperature sensor in and out of the chamber as well as pressure for a chamber mod with pressure reduction. If it is built, it’ll be submitted. ah cool. Aluminium is pretty easy to work with, all you need is a vice, hacksaw and file could give you a nice disk to sit on top of your acrylic base. you could even have it so that the disk sits inside the canister that sits on top, so that it is not exposed to the external atmosphere. After seeing a different cloud chamber build, I am surprised to see them using Acrylic for the viewing window. The other build had a problem of “solvent crazing” from the alcohol used to create the clouds. The end result was that the viewing window became cloudy/obstructed. I like their mounting solution – looks like a nice build! I mentioned your name and website in my write up. I’ll update the reference with links. Your instructable was the inspiration. If you haven’t taken apart a smoke detector yet to get the americium – I highly recommend it – it’s a great sample. I’ve been experimenting with a homemade water cooling setup – and have gotten cold enough using a single peltier stage. Plan is to use this approach to build a 150mm x 100mm chamber using 6 50mm peltiers. Nice! I failed at building one of these awhile ago because of shoddy chamber construction. Same concept though, 2 peltiers and a cpu heatsink. I think I’ll give it another go sometime using these plans. Thanks for sharing.